The Holiness movement involves a set of beliefs and practices which emerged within 19th-century Methodism. A number of Evangelical Christian denominations, parachurch organizations, and movements emphasize those beliefs as central doctrine. The movement is Wesleyan-Arminian in theology, and is defined by its emphasis on John Wesley's doctrine of a second work of grace leading to Christian perfection. As of 2015[update] Holiness-movement churches had an estimated 12 million adherents. Holiness adherents believe that the "second work of grace" (or "second blessing") refers to a personal experience subsequent to regeneration, commonly called "salvation," in which the believer is cleansed of the tendency to commit sin. This experience of "entire sanctification" enables the believer to live a holy life, and ideally, to live entirely without willful sin. Reflecting this inward holiness, Holiness Christians have emphasized the Wesleyan doctrine outward holiness, which includes practices such as the wearing of modest clothing and not using profanity in speech. Holiness groups believe the moral aspects of the law of God are pertinent for today, and so expect their adherents to obey behavioral rules—for example, many groups have statements prohibiting the consumption of alcohol, participation in any form of gambling, and entertainments such as dancing and movie-going. This position does attract opposition from certain evangelicals, who charge that such an attitude refutes or slights Reformation (particularly Calvinist) teachings that the effects of original sin remain even in the most faithful of souls. 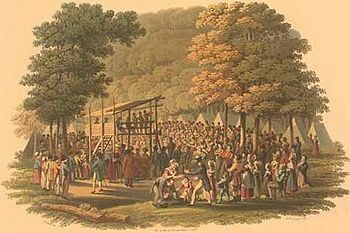 An engraving of a Methodist camp meeting in 1819 (Library of Congress). Though it became a multi-denominational movement over time and was furthered by the Second Great Awakening which energized churches of all stripes, the Holiness movement has its roots in Wesleyanism. The Methodists of the 19th century continued the interest in Christian holiness that had been started by their founder, John Wesley in England. They continued to publish Wesley's works and tracts, including his famous A Plain Account of Christian Perfection. From 1788 to 1808, the entire text of A Plain Account was placed in the Discipline manual of the Methodist Episcopal Church (U.S.), and numerous persons in early American Methodism professed the experience of entire sanctification, including Bishop Francis Asbury. By the 1840s, a new emphasis on Holiness and Christian perfection began within American Methodism, brought about in large part by the revivalism and camp meetings of the Second Great Awakening (1790–1840). Two major Holiness leaders during this period were Phoebe Palmer and her husband, Dr. Walter Palmer. In 1835, Palmer's sister, Sarah A. Lankford, started holding Tuesday Meetings for the Promotion of Holiness in her New York City home. In 1837, Palmer experienced what she called entire sanctification and had become the leader of the Tuesday Meetings by 1839. At first only women attended these meetings, but eventually Methodist bishops and hundreds of clergy and laymen began to attend as well. At the same time, Methodist minister Timothy Merritt of Boston founded a journal called the Guide to Christian Perfection, later renamed The Guide to Holiness. This was the first American periodical dedicated exclusively to promoting the Wesleyan message of Christian holiness. In 1865, the Palmers purchased The Guide which at its peak had a circulation of 30,000. At the Tuesday Meetings, Methodists soon enjoyed fellowship with Christians of different denominations, including the Congregationalist Thomas Upham. Upham was the first man to attend the meetings, and his participation in them led him to study mystical experiences, looking to find precursors of Holiness teaching in the writings of persons like German Pietist Johann Arndt and the Roman Catholic mystic Madame Guyon. Other non-Methodists also contributed to the Holiness movement in the U.S. and in England. "New School" Calvinists such as Asa Mahan, the president of Oberlin College, and Charles Grandison Finney, an evangelist associated with the college, promoted the idea of Christian holiness and slavery abolition (which Wesleyans also supported). In 1836, Mahan experienced what he called a baptism with the Holy Spirit. Mahan believed that this experience had cleansed him from the desire and inclination to sin. Finney believed that this experience might provide a solution to a problem he observed during his evangelistic revivals. Some people claimed to experience conversion but then slipped back into their old ways of living. Finney believed that the filling with the Holy Spirit could help these converts to continue steadfast in their Christian life. This phase of the Holiness movement is often referred to as the Oberlin-Holiness revival. Presbyterian William Boardman promoted the idea of Holiness through his evangelistic campaigns and through his book The Higher Christian Life, which was published in 1858, which was a zenith point in Holiness activity prior to a lull brought on by the American Civil War. Hannah Whitall Smith, an English Quaker, experienced a profound personal conversion. Sometime in the 1860s, she found what she called the "secret" of the Christian life—devoting one's life wholly to God and God's simultaneous transformation of one's soul. Her husband, Robert Pearsall Smith, had a similar experience at the camp meeting in 1867. The couple became figureheads in the now-famous Keswick Convention that gave rise to what is often called the Keswick-Holiness revival, which became distinct from the holiness movement. Also representative was the revivalism of Rev. James Caughey, an American missionary sent by the Wesleyan Methodist Church to work in Ontario, Canada from the 1840s through 1864. He brought in the converts by the score, most notably in the revivals in Canada West 1851–53. His technique combined restrained emotionalism with a clear call for personal commitment, thus bridging the rural style of camp meetings and the expectations of more "sophisticated" Methodist congregations in the emerging cities. 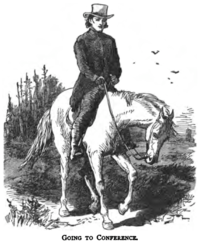 Phoebe Palmer's ministry complemented Caughey's revivals in Ontario circa 1857. At least two major Wesleyan denominations broke away from Methodism during this period. In 1843 Orange Scott organized the Wesleyan Methodist Connection (an antecedent of the Wesleyan Church) at Utica, New York. In 1860, B.T. Roberts and John Wesley Redfield founded the Free Methodist Church on the ideals of slavery abolition, egalitarianism, and second-blessing holiness. Advocacy for the poor remained a hallmark of these and other Methodist offshoots. Following the American Civil War, many Holiness proponents—most of them Methodists—became nostalgic for the heyday of camp meeting revivalism during the Second Great Awakening. The first distinct "Holiness camp meeting" convened at Vineland, New Jersey in 1867 under the leadership of John S. Inskip, John A. Wood, Alfred Cookman, and other Methodist ministers. 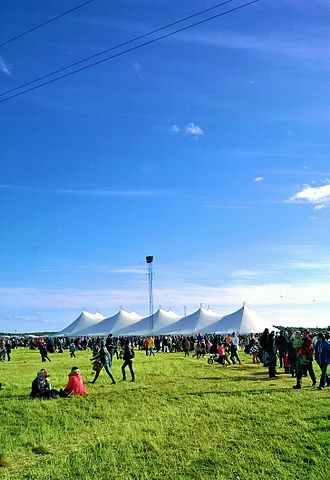 The gathering attracted as many as 10,000 people. At the close of the encampment, while the ministers were on their knees in prayer, they formed the National Camp Meeting Association for the Promotion of Holiness, and agreed to conduct a similar gathering the next year. This organization was commonly known as the National Holiness Association. Later, it became known as the Christian Holiness Association and subsequently the Christian Holiness Partnership. The second National Camp Meeting was held at Manheim, Pennsylvania, and drew upwards of 25,000 persons from all over the nation. People called it a "Pentecost." The service on Monday evening has almost become legendary for its spiritual power and influence. The third National Camp Meeting met at Round Lake, New York. This time the national press attended and write-ups appeared in numerous papers, including a large two-page pictorial in Harper's Weekly. These meetings made instant religious celebrities out of many of the workers. In the 1870s, the fervor of the Keswick-Holiness revival swept Great Britain, where it was sometimes called the higher life movement after the title of William Boardman's book The Higher Life. Higher life conferences were held at Broadlands and Oxford in 1874 and in Brighton and Keswick in 1875. The Keswick Convention soon became the British headquarters for this movement. The Faith Mission in Scotland was another consequence of the British Holiness movement. Another was a flow of influence from Britain back to the United States: In 1874, Albert Benjamin Simpson read Boardman's Higher Christian Life and felt the need for such a life himself. Simpson went on to found the Christian and Missionary Alliance. American Holiness associations began to form as an outgrowth of this new wave of camp meetings, such as the Western Holiness Association—first of the regional associations that prefigured "come-outism"—formed at Bloomington, Illinois. In 1877 several "general holiness conventions" met in Cincinnati and New York City. In 1871, the American evangelist Dwight L. Moody had what he called an "endowment with power" as a result of some soul-searching and the prayers of two Free Methodist women who attended one of his meetings. He did not join the Wesleyan-Holiness movement but maintained a belief in progressive sanctification which his theological descendants still hold to. While the great majority of Holiness proponents remained within the three major denominations of the American Methodist church, Holiness people from other theological traditions established standalone Wesleyan bodies. In 1881, D. S. Warner started the Church of God Reformation Movement, later the Church of God (Anderson, Indiana), bringing Restorationism to the Holiness family. Palmer's The Promise of the Father, published in 1859 which argued in favor of women in ministry, later influenced Catherine Booth, co-founder of the Salvation Army (the practice of ministry by women is common but not universal within the denominations of the Holiness movement). The founding of the Salvation Army in 1878 helped to rekindle Holiness sentiment in the cradle of Methodism—a fire kept lit by Primitive Methodists and other British descendants of Wesley and George Whitefield in prior decades. Overseas missions emerged as a central focus of the Holiness people. As one example of this world evangelism thrust, Pilgrim Holiness Church founder Martin Wells Knapp (who also founded the Revivalist in 1883, the Pentecostal Revival League and Prayer League, the Central Holiness League 1893, the International Holiness Union and Prayer League, and God's Bible School and College), saw much success in Korea, Japan, China, India, South Africa and South America. Methodist mission work in Japan led to the creation of the One Mission Society, one of the largest missionary-sending Holiness agencies in the world. Though many Holiness preachers, camp meeting leaders, authors, and periodical editors were Methodists, this was not universally popular with Methodist leadership. Out of the four million Methodists in the United States during the 1890s, probably one-third to one-half were committed to the idea of sanctification as a second work of grace. Any traveling or local preacher, or layman, who shall hold public religious services within the bounds of any mission, circuit, or station, when requested by the preacher in charge not to hold such services, shall be deemed guilty of imprudent conduct, and shall be dealt with as the law provides in such cases. Many Holiness evangelists and traveling ministers found it difficult to continue their ministry under this new rule—particularly in Methodist charges and circuits that were unfriendly to the Holiness movement. In the years that followed, scores of new Methodist and Holiness associations were formed -- many of these "come-outer" associations and various parties alienated by Mainline Methodism consolidated to form new denominations (e.g. the Church of the Nazarene). Those who left mainline Methodist churches to form Holiness denominations during this time numbered no more than 100,000. A Fundamentalist cartoon portraying Modernism as the descent from Christianity to atheism, first published in 1922 and then used in Seven Questions in Dispute by William Jennings Bryan. Throughout the early 20th century, week-long revival campaigns with local churches (and revival elements brought into the worship service) carried on the tradition of camp meetings. Pentecostalism and the Charismatic movement competed for the loyalties of Holiness advocates (see related section below), and a separate Pentecostal-Holiness movement was born. This new dichotomy gradually dwindled the population of the mainstream of the Holiness movement. Some Holiness advocates found themselves at home with Fundamentalism and later the Evangelical movement. It was during this time (1939) that the Methodist Episcopal Church (North and South) and the Methodist Protestant Church merged to form The Methodist Church. This merger created a Mainline Christian organization which made remaining Holiness elements within U.S. Methodism less influential. Grace Wesleyan Methodist Church is a parish church of the Allegheny Wesleyan Methodist Connection, one of the largest denominations in the conservative holiness movement, and is located in Akron, Ohio. Cultural shifts following World War II resulted in a further division in the Holiness movement. Not content with what they considered to be a lax attitude toward sin, several small groups left Wesleyan-Holiness denominations to form the conservative holiness movement. Staunch defenders of Biblical inerrancy, they stress modesty in dress and revivalistic worship practices. They identify with classical Fundamentalism more so than Evangelicalism. As the Holiness Conservatives were distancing themselves even further, Mainline Methodism was becoming larger with the merger between The Methodist Church and the Evangelical United Brethren Church, forming the United Methodist Church in 1968. A slow trickle of disaffected Holiness-friendly United Methodists left for Holiness movement denominations, while other Holiness advocates in the United Methodist Church fought for recognition via the Good News Movement and Confessing Movement. Meanwhile, the bulk of the Wesleyan-Holiness churches began to appear more like their colleagues in the National Association of Evangelicals from various theological and ecclesiastical traditions. Holiness Evangelicals developed a disdain for what they considered to be legalism, and gradually dropped prohibitions against dancing and theater patronage, while maintaining rules against alcohol and tobacco use. Continued stances on the sanctity of marriage and abstinence matched similar convictions held by other Evangelicals. In the 1970s, opposition to abortion became a recurring theme, and by the 1990s statements against practicing homosexuality were increasingly common. A devotion to charity work continued, particularly through the Salvation Army and other denominational and parachurch agencies. Faced with a growing identity crisis and continually dwindling numbers, Wesleyan-Holiness Evangelicals have hosted several inter-denominational conferences and begun several initiatives to draw a clearer distinction between Wesleyan theology and that of other Evangelicals and to explore how to address contemporary social issues and appear winsome to a "post-modern world." As one such example, in 2006 the Wesleyan Holiness Consortium published "The Holiness Manifesto" in conjunction with representatives from historic Holiness denominations, including the Free Methodist Church, United Methodist Church, Wesleyan Church, and the Church of the Nazarene. The divide between classical Fundamentalism and Evangelicalism became greater following the 9/11 terrorist attacks on the U.S. by militant Muslim fundamentalists—as the term "fundamental" became associated with intolerance and aggressive attitudes. Several Evangelical Holiness groups and publications have denounced the term "fundamentalist" (preferring Evangelical) while others are reconciling to what extent the Fundamentalist movement of the 1920s remains a part of their history. The Church of the Nazarene, the Wesleyan Church, and the Free Methodist Church were the largest Wesleyan-Evangelical Holiness bodies as of 2015. Talks of a merger were tabled, but new cooperatives such as the Global Wesleyan Alliance were formed as the result of inter-denominational meetings. The Reformation itself, with its emphasis on salvation by grace through faith alone. Puritanism in 17th-century England and its transplantation to America with its emphasis on adherence to the Bible and the right to dissent from the established church. Pietism in 17th-century Germany, led by Philipp Jakob Spener and the Moravians, which emphasized the spiritual life of the individual, coupled with a responsibility to live an upright life. Quietism, as taught by the Religious Society of Friends (Quakers), with its emphasis on the individual's ability to experience God and understand God's will for himself. 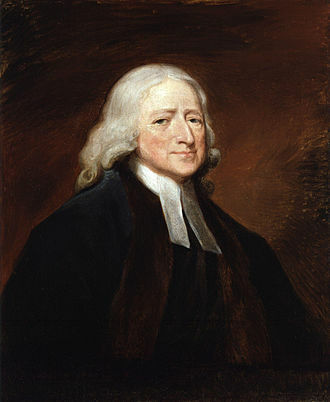 The 1730s Evangelical Revival in England, led by Methodists John Wesley and his brother Charles Wesley, which introduced the concept of Entire Sanctification and certain teachings of German Pietism to England and eventually to the United States. The First Great Awakening in the 18th and early 19th centuries in the United States, propagated by George Whitefield, Jonathan Edwards, and others, with its emphasis on the initial conversion experience of Christians. The Second Great Awakening in the 19th century in the United States, propagated by Francis Asbury, Charles Finney, Lyman Beecher, Phoebe Palmer and others, which also emphasized the need for personal holiness and is characterized by the rise of evangelistic revival meetings. The traditional Holiness movement is distinct from the Pentecostal movement, which believes that the baptism in the Holy Spirit involves supernatural manifestations such as speaking in unknown tongues. Many of the early Pentecostals originated from the Holiness movement, and to this day many "classical Pentecostals" maintain much of Holiness doctrine and many of its devotional practices. Several of its denominations include the word "Holiness" in their names, including the Pentecostal Holiness Church. The terms pentecostal and apostolic, now used by adherents to Pentecostal and charismatic doctrine, were once widely used by Holiness churches in connection with the consecrated lifestyle described in the New Testament. During the Azusa Street Revival (often considered the advent of Pentecostalism), the practice of speaking in tongues was strongly rejected by leaders of the traditional Holiness movement. Alma White, the leader of the Pillar of Fire Church, a Holiness denomination, wrote a book against the Pentecostal movement that was published in 1936; the work, entitled Demons and Tongues, represented early rejection of the tongues-speaking Pentecostal movement. White called speaking in tongues "satanic gibberish" and Pentecostal services "the climax of demon worship". However, many contemporary Holiness churches now believe in the legitimacy of speaking in unknown tongues, but not as a sign of entire sanctification as classical Pentecostals still teach. There are an estimated 78 million classical Pentecostals, and 510 million assorted Charismatics who share a heritage or common beliefs with the Pentecostal movement. If the Holiness movement and Pentecostal/Charismatic Christians were counted together the total population would be around 600 million. The Holiness movement led to the formation and further development of several Christian denominations and associations. Below are denominations which substantially adhere to Holiness movement doctrine (excluding Conservative Holiness movement and distinctively Pentecostal bodies). 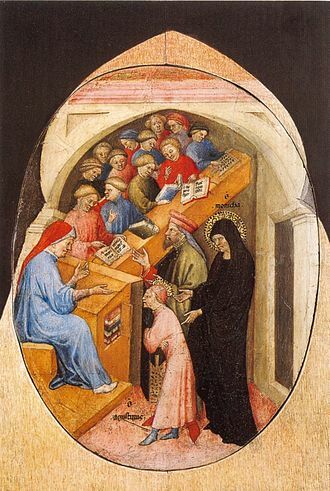 Many institutions of higher learning exist to promote Holiness ideas, as well as to provide a liberal arts education. ^ Olson, Roger E. (20 September 2009). Arminian Theology: Myths and Realities. InterVarsity Press. p. 25. ISBN 9780830874439. The entire Methodist movement and its offshoots (e.g., the multiform Holiness movement) adopted Wesley's version of Arminian theology, which differed hardly at all from Arminius himself. ^ "Holiness churches". oikoumene.org. Retrieved 31 May 2015. ^ Headley, Anthony J. (4 October 2013). "Getting It Right: Christian Perfection and Wesley's Purposeful List". Seedbed. Retrieved 29 May 2018. ^ Russell, Thomas Arthur (June 2010). Comparative Christianity: A Student's Guide to a Religion and Its Diverse Traditions. Universal-Publishers. pp. 121–. ISBN 9781599428772. Retrieved 9 November 2012. ^ Vinson Synan, The Holiness-Pentecostal Tradition: Charismatic Movements in the Twentieth Century, (Grand Rapids, Michigan: William B. Eerdmans Publishing Company, 1997 2nd ed. ), p. 8. ^ Synan 1997, p. 17. ^ Synan 1997, p. 18. ^ Yrigoyen, Charles Jr. (2013). Historical Dictionary of Methodism. Scarecrow Press. p. 186. ^ "Fundamental Wesleyan". fwponline.cc. Retrieved 31 May 2015. ^ "Why the Holiness Movement is Dead". Asbury Journal. Retrieved 4 June 2017. ^ "About Us". holinesslegacy.com. Retrieved 31 May 2015. ^ "About". Seedbed. Retrieved 31 May 2015. ^ Mannoia, Kevin W.; Thorsen, Don (2008). The Holiness Manifesto. Grand Rapids, MI: Eerdmans. pp. 18–21. ^ "Early Church Lesson #1: Fundamentals without Fundamentalism". Seedbed Daily Text. Retrieved 31 May 2015. ^ "- Church of the Nazarene". ncnnews.com. Retrieved 31 May 2015. ^ "Global Wesleyan Alliance has 3rd annual gathering - The Wesleyan Church". wesleyan.org. Retrieved 31 May 2015. ^ "The Outpouring of the Holy Ghost at Azusa Street Mission". revempete.us. Retrieved 31 May 2015. ^ "Pentecostal churches". oikoumene.org. Retrieved 31 May 2015. ^ Dave Imboden. "Universities & Colleges". holinessandunity.org. Retrieved 31 May 2015. Boardman, William E. The Higher Christian Life, (Boston: Henry Hoyt, 1858). Brown, Kenneth O. Holy Ground, Too, The Camp Meeting Famil Tree. Hazleton: Holiness Archives, 1997. Cunningham, Floyd. T. " Holiness Abroad: Nazarene Missions in Asia. " Pietist and Wesleyan Studies, No. 16. Lanham, MD: Scarecrow Press, 2003. Cunningham, Floyd T. ed. "Our Watchword & Song: The Centennial History of the Church of the Nazarene." By Floyd T. Cunningham; Stan Ingersol; Harold E. Raser; and David P. Whitelaw. Kansas City, MO: Beacon Hill Press of Kansas City, 2009. Dieter, Melvin E. The Holiness Revival of the Nineteenth Century (Rowman & Littlefield, 1996). Grider, J. Kenneth. A Wesleyan-Holiness Theology, 1994 (ISBN 0-8341-1512-3). Hong, Paul Yongpyo, " Spreading the Holiness Fire: The History of OMS Korea Holiness Church 1902–1957." D. Miss dissertation of Fuller Theological Seminary (1996). Hong, Paul Yongpyo, " A History of the Korea Evangelical Holiness Church for 110 Years. " (Seoul: WWGT, 2010). Hong, Paul Yongpyo ed. " Pentecostal Holiness Theology With Regard To M. W. Knapp." (Seoul: Pentecost Press, 2013). Hong, Paul et al., " The Founders and Their Thoughts of the Holiness Movement in the Late 19th Century: M. W. Knapp, S. C. Rees, W. Godbey and A. M. Hills." (KEHC Love Press, 2014). Kostlevy, William C., ed. Historical Dictionary of the Holiness Movement (Rowman & Littlefield, 2001). Smith, Logan Pearsall, ed. Philadelphia Quaker: The Letters of Hannah Whitall Smith (New York: Harcourt, Brace and Co., 1950). Smith, Timothy L. Called Unto Holiness: The Story of the Nazarenes—The Formative Years, (Nazarene Publishing House, 1962). Stephens, Randall J. The Fire Spreads: Holiness and Pentecostalism in the American South." (Cambridge, MA: Harvard University Press, 2008). Thornton, Wallace Jr. When the Fire Fell: Martin Wells Knapp's Vision of Pentecostal and the Beginnings of God's Bible School " (Emeth Press, 2014). White, Charles Edward. The Beauty of Holiness: Phoebe Palmer as Theologian, Revivalist, Feminist, and Humanitarian (Zondervan/Francis Asbury Press, 1986). McDonald, William and John E. Searles. The Life of Rev. John S. Inskip, President of the National Association for the Promotion of Holiness (Chicago: The Christian Witness Co., 1885). Smith, Hannah Whitall. The Unselfishness of God, and How I Discovered It: A Spiritual Autobiography (New York: Fleming H. Resell Co., 1903). Anselm of Canterbury was a Benedictine monk, abbot and theologian of the Catholic Church, who held the office of archbishop of Canterbury from 1093 to 1109. After his death, he was canonized as a saint, his feast day is 21 April, beginning at Bec, Anselm composed dialogues and treatises with a rational and philosophical approach, sometimes causing him to be credited as the founder of Scholasticism. Despite his lack of recognition in this field in his own time, Anselm is now famed as the originator of the argument for the existence of God. He was proclaimed a Doctor of the Church by a bull of Pope Clement XI in 1720, as archbishop, he defended the churchs interests in England amid the Investiture Controversy. For his resistance to the English kings William II and Henry I, he was exiled twice, once from 1097 to 1100, while in exile, he helped guide the Greek bishops of southern Italy to adopt Roman rites at the Council of Bari. Anselm was born in or around Aosta in Upper Burgundy sometime between April 1033 and April 1034, the area now forms part of the Republic of Italy, but Aosta had been part of the Carolingian Kingdom of Arles until the death of the childless Rudolph III in 1032. The Emperor and the Count of Blois went to war over his succession, humbert the White-Handed, count of Maurienne, so distinguished himself that he was granted a new county carved out of the secular holdings of the less helpful bishop of Aosta. Otto and Adelaides unified lands controlled the most important passes in the western Alps and formed the county of Savoy whose dynasty would rule the kingdoms of Sardinia. Records during this period are scanty, but both sides of Anselms immediate family appear to have been dispossessed by these decisions in favour of their extended relations. 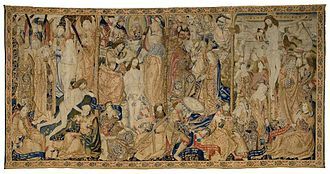 The marriage was probably arranged for political reasons but was incapable of resisting Conrads decrees after his successful annexation of Burgundy on 1 August 1034. Ermenberga appears to have been the wealthier of the two, Gundulph moved to his wifes town, where she held a palace, likely near the cathedral, along with a villa in the valley. In life, there are records of three relations who visited Bec, Folceraldus and Rainaldus. The first repeatedly attempted to impose on Anselms success but was rebuffed owing to his ties to another monastery, at the age of fifteen, Anselm desired to enter a monastery but, failing to obtain his fathers consent, he was refused by the abbot. The illness he suffered has been considered a psychosomatic effect of his disappointment, once Gundulph had entered a convent, Anselm, at age 23, left home with a single attendant, crossed the Alps, and wandered through Burgundy and France for three years. His countryman Lanfranc of Pavia was prior of the Benedictine abbey of Bec, attracted by the fame of his fellow countryman, after spending some time in Avranches, he returned the next year. His father having died, he consulted with Lanfranc as to whether to return to his estates and employ their income in providing alms or to renounce them, becoming a hermit or a monk at Bec or Cluny. Professing to fear his own bias, Lanfranc sent him to Maurilius, the archbishop of Rouen, probably in his first year, he wrote his first work on philosophy, a treatment of Latin paradoxes called the Grammarian. John Wesley was an Anglican cleric and theologian who, with his brother Charles and fellow cleric George Whitefield, founded Methodism. Educated at Charterhouse School and Christ Church, Wesley was elected a fellow of Lincoln College, Oxford in 1726, after an unsuccessful ministry of two years at Savannah in the Georgia Colony, Wesley returned to London and joined a religious society led by Moravian Christians. On 24 May 1738 he experienced what has come to be called his evangelical conversion and he subsequently departed from the Moravians, beginning his own ministry. A key step in the development of Wesleys ministry was, like Whitefield, to travel, in contrast to Whitefields Calvinism, Wesley embraced the Arminian doctrines that dominated the Church of England at the time. Moving across Great Britain and Ireland, he helped form and organise small Christian groups that developed intensive and personal accountability, most importantly, he appointed itinerant, unordained evangelists to travel and preach as he did and to care for these groups of people. Under Wesleys direction, Methodists became leaders in social issues of the day, including prison reform. Although he was not a theologian, Wesley argued for the notion of Christian perfection and against Calvinism—and, in particular. He held that, in life, Christians could achieve a state where the love of God reigned supreme in their hearts. Throughout his life, Wesley remained within the established Church of England, in 2002, he was placed at number 50 in the BBCs poll of the 100 Greatest Britons. John Wesley was born in 1703 in Epworth,23 miles north-west of Lincoln, as the child of Samuel Wesley. Samuel Wesley was a graduate of the University of Oxford and a poet who and he married Susanna, the twenty-fifth child of Samuel Annesley, a dissenting minister, in 1689. Ultimately, she bore nineteen children, of nine lived beyond infancy. She and Samuel Wesley had become members of the Church of England as young adults, as in many families at the time, Wesleys parents gave their children their early education. The most widely recognized Biblical foundations for the doctrines formulation are in the Gospel of John. Nontrinitarianism is any of several Christian beliefs that reject the Trinitarian doctrine that God is three persons in one being. Modern nontrinitarian groups views differ widely on the nature of God, the Biblical canon is the set of books Christians regard as divinely inspired and thus constituting the Christian Bible. The writings attributed to the apostles circulated amongst the earliest Christian communities, the Pauline epistles were circulating in collected form by the end of the 1st century AD. Justin Martyr, in the early 2nd century, mentions the memoirs of the apostles, but his references are not detailed. Around 160 Irenaeus of Lyons argued for only four Gospels, and argued that it would be illogical to reject Acts of the Apostles but accept the Gospel of Luke, as both were from the same author. Likewise by 200 the Muratorian fragment shows that existed a set of Christian writings somewhat similar to what is now the 27-book New Testament. In his Easter letter of 367, Bishop of Alexandria, gave a list exactly the same in number and order with what would become the New Testament canon and be accepted by the Greek church. The African Synod of Hippo, in 393, approved the New Testament, as it today, together with the Septuagint books. Pope Damasus Is Council of Rome in 382, only if the Decretum Gelasianum is correctly associated with it, in 405, Pope Innocent I sent a list of the sacred books to a Gallic bishop, Exsuperius of Toulouse. Nonetheless, a full articulation of the canon was not made until the Council of Trent in the 16th century. The emergence of Christian theology has sometimes been presented as the triumph of Hellenistic rationality over the Hebraic faith of Jesus, the early African theologian Tertullian, for instance, complained that the Athens of philosophy was corrupting the Jerusalem of faith. 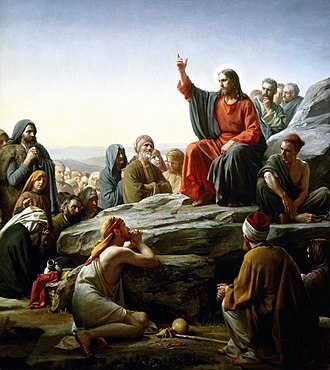 More recent discussions have qualified and nuanced this picture, from the very beginning of the Christian movement, followers of Jesus tried to make sense of the impact of Jesus of Nazareth, and began arguing about differing ways of making sense. The Council of Ephesus was a council of Christian bishops convened in Ephesus in AD431 by the Roman Emperor Theodosius II. It met in June and July 431 at the Church of Mary in Ephesus in Anatolia, Nestorius himself had requested the Emperor to convene the council, hoping that it would prove his orthodoxy, the council in fact condemned his teachings as heresy. The council declared Mary as Theotokos, Nestorius dispute with Cyril had led the latter to seek validation from Pope Celestine I, who authorized Cyril to request that Nestorius recant his position or face excommunication. Nestorius pleaded with the Eastern Roman Emperor Theodosius II to call a council in which all grievances could be aired, hoping that he would be vindicated, the proceedings were conducted in a heated atmosphere of confrontation and recriminations and created severe tensions between Cyril and Theodosius II. Nestorius was decisively outplayed by Cyril and removed from his see, Nestorius himself retired to a monastery, always asserting his orthodoxy. McGuckin cites the innate rivalry between Alexandria and Constantinople as an important factor in the controversy between Cyril of Alexandria and Nestorius, according to McGuckin, Cyril viewed the elevated intellectual argument about christology as ultimately one and the same as the validity and security of the simple Christian life. Even within Constantinople, some supported the Roman-Alexandrian and others supported the Nestorian factions, for example, Pulcheria supported the Roman-Alexandrian popes while the emperor and his wife supported Nestorius. Contention over Nestorius teachings, which he developed during his studies at the School of Antioch, shortly after his arrival in Constantinople, Nestorius became involved in the disputes of two theological factions, which differed in their Christology. Nestorius was greatly surprised that what he had taught in Antioch without any controversy whatsoever should prove to be so objectionable to the Christians of Constantinople. Nestorius suggested the title Christotokos, but this proposal did not gain acceptance on either side. Nestorius tried to answer a question considered unsolved, How can Jesus Christ, being part man, not be partially a sinner as well, since man is by definition a sinner since the Fall. To solve that he taught that Mary, the mother of Jesus gave birth to the incarnate Christ, not the divine Logos who existed before Mary, the Logos occupied the part of the human soul. But wouldnt the absence of a human soul make Jesus less human, Nestorius argued that the Virgin Mary should be called Christotokos, Greek for Birth Giver of Christ, and not Theotokos, Greek for Birth Giver of God. Nestorius believed that no union between the human and divine was possible, nestoriuss opponents charged him with detaching Christs divinity and humanity into two persons existing in one body, thereby denying the reality of the Incarnation. Eusebius, a layman who became the bishop of the neighbouring Dorylaeum was the first to accuse Nestorius of heresy, Cyril argued that Nestorianism split Jesus in half and denied that he was both human and divine. Christology is the field of study within Christian theology which is primarily concerned with the nature and person of Jesus as recorded in the canonical Gospels and the epistles of the New Testament. Primary considerations include the relationship of Jesus nature and person with the nature, as such, Christology is concerned with the details of Jesus ministry, his acts and teachings, to arrive at a clearer understanding of who he is in his person, and his role in salvation. The views of Paul the Apostle provided a major component of the Christology of the Apostolic Age, Pauls central themes included the notion of the pre-existence of Christ and the worship of Christ as Kyrios. The pre-existence of Christ became a theme of Christology. Proponents of Christs deity argue the Old Testament has many cases of Christophany, Christophany is often considered a more accurate term than the term theophany due to the belief that all the visible manifestations of God are in fact the preincarnate Christ. Many argue that the appearances of the Angel of the Lord in the Old Testament were the preincarnate Christ, many understand the angel of the Lord as a true theophany. From the time of Justin on, the figure has been regarded as the preincarnate Logos, following the Apostolic Age, the early church engaged in fierce and often politicized debate on many interrelated issues. Christology became a focus of these debates, and every one of the first seven ecumenical councils addressed Christological issues. 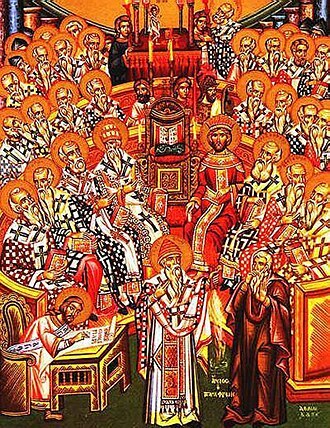 The second through fourth of these councils are generally entitled Christological councils, the Council of Chalcedon in 451 issued a formulation of the being of Christ — that of two natures, one human and one divine, united with neither confusion nor division. Chalcedonian Christianity - Eastern Orthodox, Roman Catholic, and many Protestant Christians - continue to advocate this doctrine of the hypostatic union, due to politically-charged differences in the 4th century, schisms developed, and the first denominations formed. 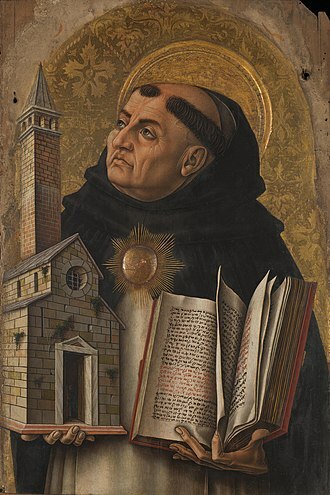 In the 13th century, Saint Thomas Aquinas provided the first systematic Christology that consistently resolved a number of the existing issues, in his Christology from above, Aquinas championed the principle of perfection of Christs human attributes. The Middle Ages witnessed the emergence of the image of Jesus as a friend. Over the centuries, a number of terms and concepts have been developed within the framework of Christology to address the seemingly simple questions, a good deal of theological debate has ensued and significant schisms within Christian denominations took place in the process of providing answers to these questions. After the Middle Ages, systematic approaches to Christology were developed, the term Christology from above refers to approaches that begin with the divinity and pre-existence of Christ as the Logos, as expressed in the prologue to the Gospel of John. These approaches interpret the works of Christ in terms of his divinity, Christology from above was emphasized in the ancient Church, beginning with Ignatius of Antioch in the second century. The Athanasian Creed, known as Pseudo-Athanasian Creed or Quicunque Vult, is a Christian statement of belief focused on Trinitarian doctrine and Christology. The Latin name of the creed, Quicunque vult, is taken from the opening words, the creed has been used by Christian churches since the sixth century. It is the first creed in which the equality of the three persons of the Trinity is explicitly stated and it differs from the Nicene-Constantinopolitan and Apostles Creeds in the inclusion of anathemas, or condemnations of those who disagree with the creed. It was designed to distinguish Nicene Christianity from the heresy of Arianism, this Creed was recited at the Sunday Office of Prime in the Western Church, it is not in common use in the Eastern Church. The creed has never gained acceptance in liturgy among Eastern Christians since it was considered as one of many unorthodox fabrications that contained the Filioque clause, the Athanasian Creed is rarely used even in the Western Church. When used, one practice is to use it once a year on Trinity Sunday. A medieval account credited Athanasius of Alexandria, the defender of Nicene theology. According to this account, Athanasius composed it during his exile in Rome and this traditional attribution of the Creed to Athanasius was first called into question in 1642 by Dutch Protestant theologian G. J. Athanasius name seems to have attached to the creed as a sign of its strong declaration of Trinitarian faith. The reasoning for rejecting Athanasius as the author usually relies on a combination of the following, The creed originally was most likely written in Latin, neither Athanasius nor his contemporaries ever mention the Creed. It is not mentioned in any records of the ecumenical councils and it appears to address theological concerns that developed after Athanasius died. It was most widely circulated among Western Christians, the use of the creed in a sermon by Caesarius of Arles, as well as a theological resemblance to works by Vincent of Lérins, point to Southern Gaul as its origin. The most likely time frame is in the fifth or early sixth century AD – at least 100 years after Athanasius. Early Christianity is the period of Christianity preceding the First Council of Nicaea in 325. It is typically divided into the Apostolic Age and the Ante-Nicene Period, the early Gospel message was spread orally, probably in Aramaic, but almost immediately in Greek. 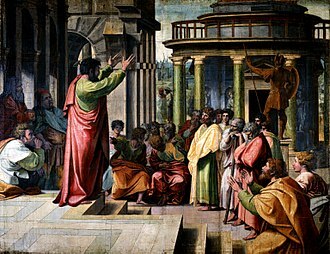 After the conversion of Paul the Apostle, he claimed the title of Apostle to the Gentiles, Pauls influence on Christian thinking is said to be more significant than that of any other New Testament author. As the New Testament canon developed, the Pauline epistles, the canonical gospels, Early Christians demonstrated a wide range of beliefs and practices, many of which were denounced as heretical. The earliest followers of Jesus composed an apocalyptic, Second Temple Jewish sect, the first part of the period, during the lifetimes of the Twelve Apostles, is called the Apostolic Age. The relationship of Paul the Apostle and Judaism is still disputed although Pauls influence on Christian thinking is said to be more significant than any other New Testament author and they think the Christians the cause of every public disaster, of every affliction with which the people are visited. The first action taken against Christians by the order of an emperor occurred half a century earlier under Nero after the Great Fire of Rome in 64 AD. During the Ante-Nicene Period following the Apostolic Age, a diversity of views emerged simultaneously with strong unifying characteristics lacking in the apostolic period. Part of the trend was an increasingly harsh anti-Judaism and rejection of Judaizers. Early Christianity gradually grew apart from Judaism during the first two centuries and established itself as a predominantly gentile religion in the Roman Empire. From the writings of early Christians, historians have tried to piece together an understanding of various early Christian practices including worship services, Early Christian writers such as Justin Martyr described these practices. Early Christian beliefs regarding baptism probably predate the New Testament writings and it seems certain that numerous Jewish sects and certainly Jesuss disciples practised baptism, which became integral to nearly every manifestation of the religion of the Jews. Gregory Palamas was a monk of Mount Athos in Greece and the Archbishop of Thessaloniki known as a preeminent theologian of Hesychasm. The teachings embodied in his writings defending Hesychasm against the attack of Barlaam are sometimes referred to as Palamism, Palamas is venerated as a Saint in the Eastern Orthodox Church. Some of his writings are collected in the Philokalia, the second Sunday of the Great Lent is called the Sunday of Gregory Palamas in those Churches that commemorate him according to the Byzantine Rite. He has a feast day on November 14, Gregory was born in Constantinople in the year 1296. His father was a courtier of the Byzantine Emperor Andronikos II Palaiologos, the Emperor himself took part in the raising and education of the fatherless boy. 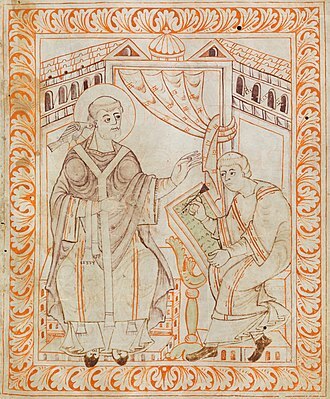 The Emperor had hoped that the gifted Gregory would devote himself to government service, St Gregory received his secular philosophical training from Theodore Metochites. Eventually, he was tonsured a monk, and continued his life of asceticism, after the demise of the Elder Nicodemus, Gregory spent eight years of spiritual struggle under the guidance of a new Elder, Nicephorus. After this last Elders repose, Gregory transferred to the Great Lavra of St. Athanasius the Athonite on Mount Athos, where he served the brethren in the trapeza and in church as a cantor. Wishing to devote himself fully to prayer and asceticism he entered a skete called Glossia. In 1326, because of the threat of Turkish invasions, he and the brethren retreated to the city of Thessaloniki. Dividing his time between his ministry to the people and his pursuit of perfection, he founded a small community of hermits near Thessaloniki in a place called Veria. He served for a time as Abbot of the Esphigmenou Monastery but was forced to resign in 1335 due to discontentment regarding the austerity of his monastic administration. Trained in Western Scholastic theology, Barlaam was scandalized by hesychasm, as a private teacher of theology in the Western Scholastic mode, Barlaam propounded a more intellectual and propositional approach to the knowledge of God than the Hesychasts taught. On the Hesychast side, the controversy was taken up by Palamas who was asked by his monks on Mt Athos to defend hesychasm from the attacks of Barlaam. 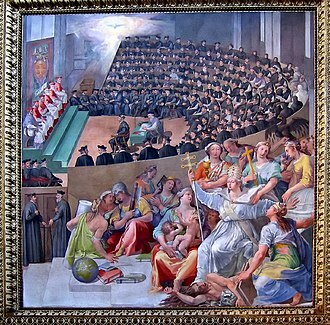 The Council of Trent, held between 1545 and 1563 in Trento and Bologna, northern Italy, was one of the Roman Catholic Churchs most important ecumenical councils. Prompted by the Protestant Reformation, it has described as the embodiment of the Counter-Reformation. Four hundred years later, when Pope John XXIII initiated preparations for the Second Vatican Council, he affirmed the decrees it had issued, What was, still is. These addressed a range of subjects, including scripture, the Biblical canon, sacred tradition, original sin, salvation, the sacraments, the Mass. The Council met for twenty-five sessions between 13 December 1545 and 4 December 1563, all in Trento, apart from the ninth to eleventh sessions held in Bologna during 1547, the consequences of the Council were significant as regards the Churchs liturgy and practices. During its deliberations, the Council made the Vulgate the official example of the Biblical canon and commissioned the creation of a standard version, although this was not achieved until the 1590s. These, in turn, led to the codification of the Tridentine Mass, more than three hundred years passed until the next ecumenical council, the First Vatican Council, was convened in 1869. A few months later, on 31 October 1517, Martin Luther issued his 95 Theses in Wittenberg, after the Pope condemned in Exsurge Domine fifty-two of Luthers theses as heresy, German opinion considered a council the best method to reconcile existing differences. German Catholics, diminished in number, hoped for a council to clarify matters. 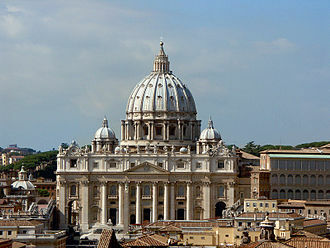 Under Pope Clement VII, troops of the Catholic Holy Roman Emperor Charles V sacked Papal Rome in 1527, killing, stealing, saint Peters Basilica and the Sistine Chapel were used for horses. This, together with the Pontiffs ambivalence between France and Germany, led to his hesitation, Charles V strongly favoured a council, but needed the support of King Francis I of France, who attacked him militarily. This proposal met the opposition of the Pope for it gave recognition to Protestants, faced with a Turkish attack, Charles held the support of the Protestant German rulers, all of whom delayed the opening of the Council of Trent. In reply to the Papal bull Exsurge Domine of Pope Leo X, Martin Luther burned the document, in 1522 German diets joined in the appeal, with Charles V seconding and pressing for a council as a means of reunifying the Church and settling the Reformation controversies. Pope Clement VII was vehemently against the idea of a council, after Pope Pius II, in his bull Execrabilis and his reply to the University of Cologne, set aside the theory of the supremacy of general councils laid down by the Council of Constance. Pope Paul III, seeing that the Protestant Reformation was no longer confined to a few preachers, yet when he proposed the idea to his cardinals, it was almost unanimously opposed. Nonetheless, he sent nuncios throughout Europe to propose the idea, Paul III issued a decree for a general council to be held in Mantua, Italy, to begin on 23 May 1537. 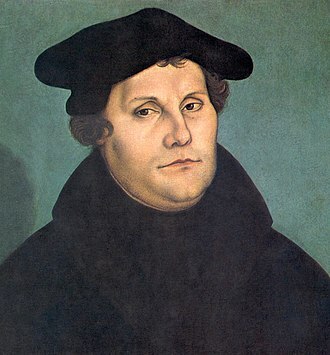 Martin Luther wrote the Smalcald Articles in preparation for the general council, the Smalcald Articles were designed to sharply define where the Lutherans could and could not compromise. The history of Christianity concerns the Christian religion and the Church with its various denominations, from the 1st century to the present. Roman Catholic and Eastern Orthodox Christianity spread to all of Europe in the Middle Ages, Christianity expanded throughout the world during Europes Age of Exploration from the Renaissance onwards, becoming the worlds largest religion. Today there are more than two billion Christians worldwide, during its early history, Christianity grew from a 1st-century Jewish following to a religion that existed across the entire Greco-Roman world and beyond. The Roman persecution of Christians ended in AD313 when Constantine the Great decreed tolerance for the religion and he called the First Council of Nicaea in AD325, beginning of the period of the First seven Ecumenical Councils. The Apostolic Church was the community led by the apostles, and to some degree, in his Great Commission, the resurrected Jesus commanded that his teachings be spread to all the world. While the historical reliability of the Acts of the Apostles is disputed by critics, Acts gives a history of the Church from this commission in 1, 3–11 to the spread of the religion among the Gentiles and the eastern Mediterranean by Paul and others. The first Christians were essentially all ethnically Jewish or Jewish proselytes, in other words, Jesus preached to the Jewish people and called from them his first disciples, see for example Matthew 10. Circumcision in particular was considered repulsive by Greeks and Hellenists while circumcision advocates were labelled Judaisers, related issues are still debated today. The doctrines of the apostles brought the Early Church into conflict with some Jewish religious authorities and this eventually led to their expulsion from the synagogues, according to one theory of the Council of Jamnia. Acts records the martyrdom of the Christian leaders and James of Zebedee, the name Christian was first applied to the disciples in Antioch, as recorded in Acts 11,26. Some contend that the term Christian was first coined as a term, meaning little Christs, and was meant as a mockery. The sources for the beliefs of the community include the Gospels. According to a recorded by Eusebius and Epiphanius, the Jerusalem church fled to Pella at the outbreak of the First Jewish–Roman War. The post-apostolic period concerns the time after the death of the apostles until persecutions ended with the legalisation of Christian worship under Emperors Constantine the Great, according to the New Testament, Christians were subject to various persecutions from the beginning. This involved even death for Christians such as Stephen and James, according to Church tradition, it was under Neros persecution that Peter and Paul were each martyred in Rome. Similarly, several of the New Testament writings mention persecutions and stress endurance through them, the last and most severe persecution organised by the imperial authorities was the Diocletianic Persecution,303 -311. In spite of these sometimes intense persecutions, the Christian religion continued its spread throughout the Mediterranean Basin, There is no agreement on how Christianity managed to spread so successfully prior to the Edict of Milan and the establishment of Christianity as the state religion of the Roman Empire. Specifically, monothelitism is the view that Jesus Christ has two natures but only one will. This is contrary to the Christology that Jesus Christ has two corresponding to his two natures. 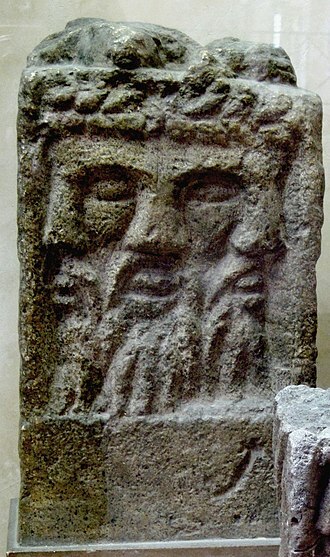 Monothelitism is a development of the miaphysite or monophysite position in the Christological debates, formulated in 638, it enjoyed considerable popularity, even garnering patriarchal support, before being rejected and denounced as heretical in 681 at the Third Council of Constantinople. During the 5th century, some regions of the Christian Church were thrown into confusion because of the debates that erupted over the nature of Jesus Christ. Although the Church had already determined that Christ is the son of God, the Church had declared heretical the notion that Jesus is not fully divine in the 4th century, during the debates over Arianism and had declared that he is God the Son become human. 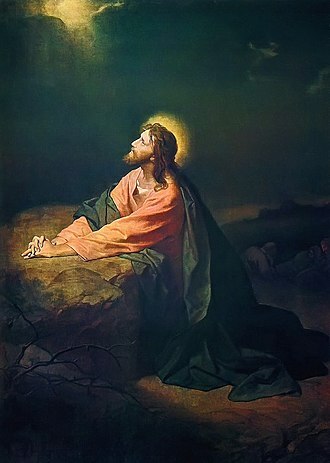 However, in arguing that he is both God and man, there now emerged a dispute over exactly how the human and divine natures of Christ actually exist within the person of Christ and this position was opposed by the Monophysites who held that Christ possesses one nature only. The term Monophysitism of which Eutychianism is one type, held that the human, as described by Eutyches, his human nature was dissolved like a drop of honey in the sea, and therefore his nature is really divine. This is distinct from Miaphysitism, which holds that, after the union, the two are thus united without separation, without confusion, and without alteration, and with each having a particularity. 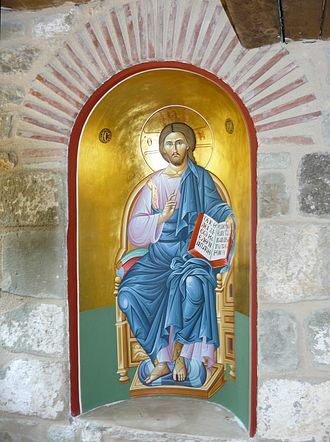 Miaphysitism is the doctrine of the Oriental Orthodox churches. Nevertheless, the resultant debates led the Chalcedonians to accuse the non-Chalcedonians of teaching Christs humanity to be of a different kind from our own. Meanwhile, the accused the Chalcedonians of espousing a form of Nestorianism. In these provinces, the non-Chalcedonians′ were far more numerous than the Chalcedonians, in Egypt for instance, some 30,000 Greeks of Chalcedonian persuasion were ranged against some five million Coptic non-Chalcedonians. Meanwhile and Mesopotamia were divided between Nestorianism and Jacobitism, while the religion of Armenia was wholly Cyrilline Non-Chalcedonian, the Monothelite teaching emerged as a compromise position. Rembrandt's The Evangelist Matthew Inspired by an Angel. 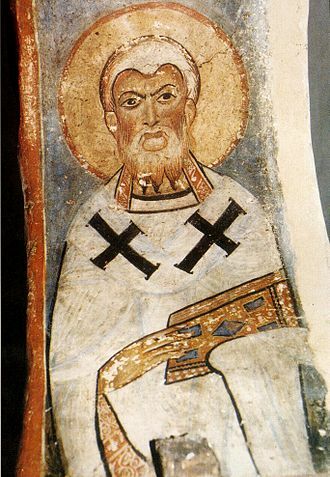 A Greek fresco of Athanasius of Alexandria, the chief architect of the Nicene Creed, formulated at Nicaea. The ongoing debates about the nature of Christ caused controversy within the Christian Church for centuries. The Emperor Heraclius defeating the Persian king Khosrau II (allegory). His desire to secure internal harmony within the empire saw him adopt the doctrine of Monothelitism. Pope Martin I, who led opposition in the West to Monothelitism. Emperor Constantine IV. He convened the Sixth Ecumenical Council in 678. Byzantine Iconoclasm, Chludov Psalter, 9th century. "Saint Gregory" by Zurbaran. The papal tiara he is depicted wearing here is anachronistic. A cross at Bec Abbey commemorating the connection between it and Canterbury. Lanfranc, Anselm, and Theobald were all priors at Bec before serving as primates over England. Metropolitan Church of Saint Gregory Palamas in Thessaloniki (arch. Ernst Ziller), where his relics are found. 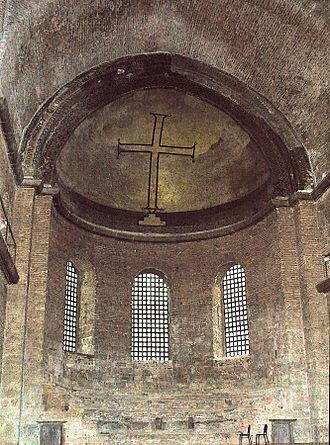 Interior of the Cathedral, Thessaloniki. Martin Luther's 1534 Bible translated into German. Luther's translation influenced the development of the current Standard German. 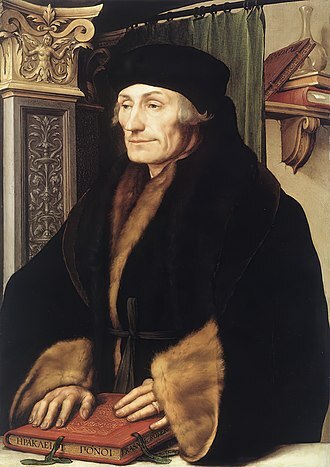 Erasmus was a Catholic priest who inspired some of the Protestant reformers. A Catholic bishop granting plenary indulgences for the public during times of calamity. Note the almsgiving in the background. Wall fresco by Italian artist Lorenzo Lotto, Suardi, Italy, circa 1524. Archbishop Socrates B. Villegas bestows the Easter Mass Plenary Indulgence in 2012 (St. John the Evangelist Metropolitan Cathedral, Dagupan City, Pangasinan). A 1948 reproduction of the Stradanus engraving, a 17th-century certificate for indulgences, in return for cash contributions to build a shrine. Statues of William Farel, John Calvin, Theodore Beza, and John Knox at the centre of the International Monument to the Reformation in Geneva, Switzerland. They were among the most influential theologians that helped develop the Reformed tradition. Calvin preached at St. Pierre Cathedral, the main church in Geneva. Calvinism has been known at times for its simple, unadorned churches and lifestyles, as depicted in this painting of the interior of the Oude kerk in Amsterdam by Emanuel de Witte c. 1661. Anne Boleyn, Henry VIII's second wife, by an unknown artist. National Portrait Gallery, London. Thomas Cromwell, 1st Earl of Essex (c. 1485–1540), Henry VIII's chief minister 1532–40. Thomas More, with John Fisher the leader of political resistance against the break with Rome. Both were executed in 1535. 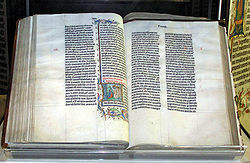 The Tyndale Bible was the basis for later English translations. This 1711 illustration for the Index Librorum Prohibitorum depicts the Holy Ghost supplying the book burning fire. The "Five Brothers of Württemberg Pietism: Johannes Schnaitmann, (1767-1847), Anton Egeler, (1770-1850), Johann Martin Schäffer, (1763-1851), Immanuel Gottlieb Kolb (1784-1859), and Johann Michael Hahn (1758-1819). Pietistic Lutheran frugality, humility, restraint, sense of duty and order have been strong cultural and religious influences in Scandinavia. Summer services are a feature of Laestadian Lutheran piety. 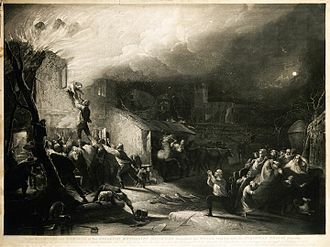 The rescue of the young John Wesley from the burning rectory. Mezzotint by Samuel William Reynolds. Christ Church, cathedral of the Diocese of Oxford, Wesley's college chapel and place of ordination. Wesley preaching to a tribe of Native Americans. Engraving. A contemporary Mass in modern practice. As versus populum became the common posture and gesture practised after the council. Note that the priest faces the congregation, while the vestments and religious artwork are less intense and ornate. The abolition of Friday of Sorrows of the Virgin Mary (not to be confused with Good Friday which commemorates the crucifixion of Jesus) as unnecessary repetition before Palm Sunday is an example of changes in the Liturgical Calendar after the council. The Virgin of Hope of Macarena, in her imperial regalia, Spain. The Second Vatican Council encouraged the scriptural reading of the Bible rather than relying solely on devotional writings, booklets and the lives of the Catholic saints. The first Methodist chapel, "The Foundery", London. This 19th-century painting by Julius Hübner sensationalizes Luther's posting of the Theses before a crowd. In reality, posting theses for a disputation would have been routine. Funerary stele of Licinia Amias on marble. 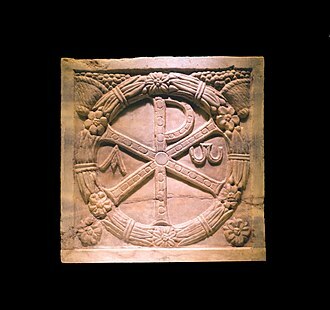 One of the earliest Christian inscriptions found, it comes from the early 3rd-century Vatican necropolis area in Rome. Christ Jesus, the Good Shepherd, 3rd century. Virgin and Child. 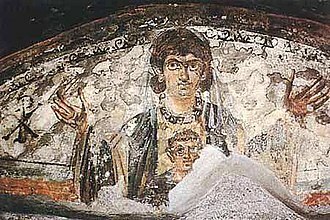 Wall painting from the early catacombs, Rome, 4th century. Leo Tolstoy wrote extensively about Christian pacifism and anarchism. 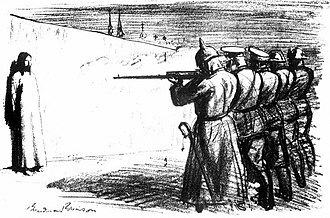 The Deserter (1916) by Boardman Robinson. Dorothy Day, co-founder of the Catholic Workers. Paolo Veronese, The Resurrection of Jesus Christ (ca. 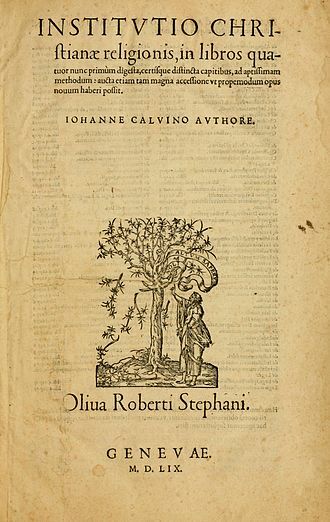 1560). A scroll of the Book of Esther; one of the five megillot of the Tanakh. The Abisha Scroll, the oldest scroll among the Samaritans in Nablus. A folio from P46; an early 3rd-century collection of Pauline epistles. The rubric above this 13th-century illuminated manuscript translates "twelve articles of faith set out by twelve apostles". Athanasius of Alexandria was traditionally thought to be the author of the Athanasian Creed, and gives his name to its common title. Detail of a manuscript illustration depicting a knight carrying the "Shield of the Trinity."